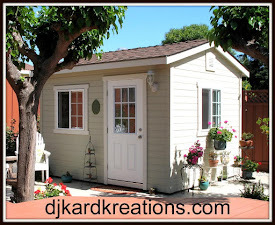 djkardkreations: Thank You DI Blog Hop! Thank You DI Blog Hop! Today is a very special day! 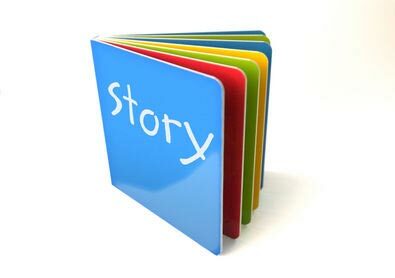 But first, the back story. Back when I started blogging, one of the first challenges that welcomed me with open arms and taught me how to have fun and not take any of it too seriously was Pixie's Snippets Playground. As the name suggests, if you want to go to the Playground and join in this challenge, all you need to do is bring your creation with at least one element made with a snippet ~ or scrap, left-over, remnant, or whatever you want to call it! The Headmistress of Pixie's Snippet Playground is affectionately known as "Di." She is beloved by all the playmates who come through the gates! Like my NBUS challenge encouraged you to use your new schtuff, Di's challenge encourages you to be mindful of your snippets and use them, rather than reach for another virginal piece of paper or ribbon. AND NOW WHY WE'RE HERE! 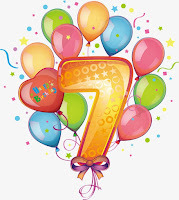 Di recently celebrated her SEVENTH anniversary as Headmistress of Pixie's, having taken over the beginning of 2012 from the lovely Jules! That's an enormous accomplishment! Not only that, but in addition to the linky for each challenge, Di also offers a generous prize out-of-pocket! So today I have set up this Linky Party for all of Di's friends to get together en mass to thank her for all she has done for us all these years! To play along, please post a card and thank Di on your blog, and then come back here to link your card below. The linky will be open until end of day February 10. I tried to locate every playmates email address, but there were some I couldn't find. Please spread the word to others about this Hop, so we will touch base with those I couldn't find and those where my email might have gone into their spam folder. Thank you! This sassy silhouette is NBUS from Stampers Anonymous, stamped over a bed of watercolored splotches. (You can tell some were made by Hammy!) It was given to me by my friend Annie a few (cough)s ago and this occasion was perfect for its first inking. I made and Ziggified the little snippet party hat for her. I think the NBUS sediment, from Crackerbox & Suzy Stamps, fits Di perfectly ~ and all of us for that matter! The cool front panel is a snippet of DSP from my hoard stash. The stitched oval from PTI was cut from a mixed media snippet and outlined in the same ink from CP that I used for the sediment which is NBUS from Creative Vision Stamps. 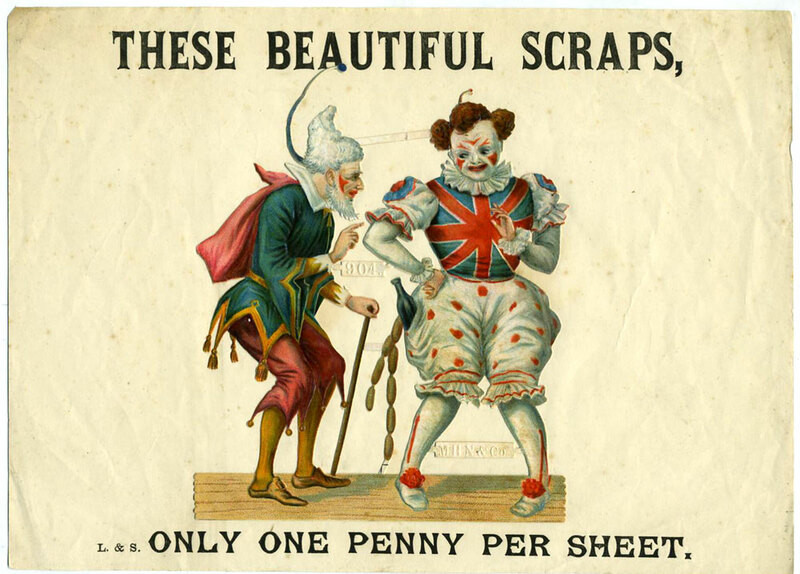 A bit of shiny bling and a few splotches by Hammy and you have a funny QACAS card perfect for the playmates' amusement! 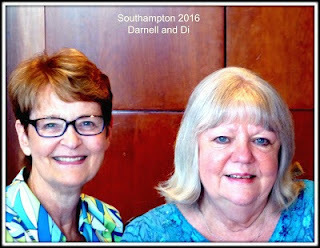 I'm delighted to share that I had the privilege of meeting Di in person during my England Tour of 2016. She is just as sweet, generous, and kind as you imagine her to be! Thank you, Di, for all you do to keep the Playground running, welcoming, and fun ~ and for your treasured friendship! I want you to know I'm thinking of you if you are in regions where the temperatures are breaking freezing cold records and Down Under where scalding hot temperatures are breaking heat records and starting fires. As always, thank you for coming by to visit the Playhouse and special thanks to you if you take the time to join as a follower! Please let me know you came by so I can be sure and return the flavor! Be safe out there. The linky will be open until 11:55 p.m. PST on February 10th for you to join us! The idea is for everyone to HOP through the links in the gallery below and enjoy the personal tributes everyone is writing about Di on their blogs, adding comments as you go. It's a massive love fest, ladies! Labels: Thank You HOP For Di! I love both of your fun cards Darnell. I'll hop back later today with my entry to the linky. A Fabulous idea and thank you for organising it and thanks to Di too, for being such a cool playground monitor too! Well, just popped over to see if it was time Darnell? 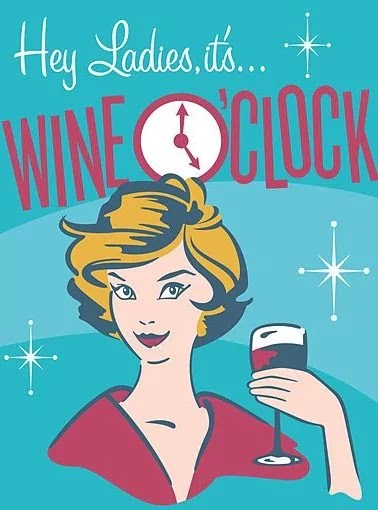 ... and it was, as it’s 8:18pm Downunder it’s tricky to work out your time zone! I can figure UK much easier then for some reason my brain freezes over for any more hours behind! Love your cards, and do hope Di loves her surprise blog hop. Managed to finish my cards and do a twofer, almost ... except occasion is same. But of course I’ve more snippets of both so can do another anyways! Thanks for your thoughts Downunder, we baldy need the rain in so many places, praying for all to be kept safe. God bless, dear Darnell, and ☺️ thank YOU, DI! I'm doing my card to link up! Big hugs and thanks for organizing the event for Di!!! Great idea Darnell . . . very kind of you to surprise Di like this. Love both your Snippets cards. Wow, how fun!! Thanks for sharing the story in your fabulous style and for sharing the two fantastic cards you made. So much fun! I'm learning to do the same, my friend, and enjoying what I can do so much more. You are a treasure and a gem. Hugs! A great post .. .. Di is sure to love it! 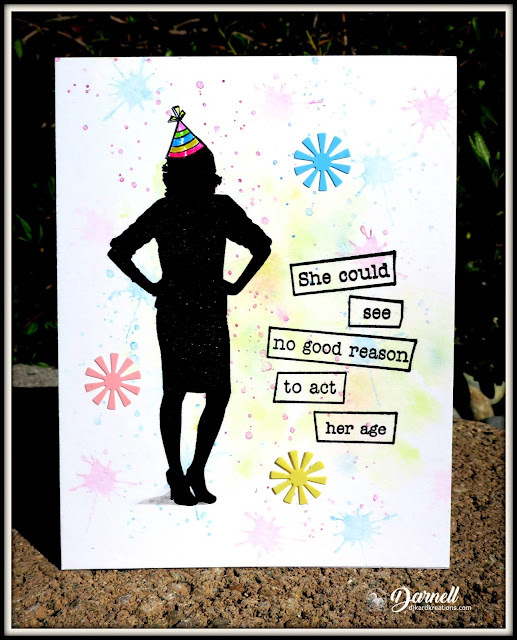 Two fabulous cards to get the blog hop going! I was thinking you had patiently inked through a stencil on your second card to begin with. Many thanks for organising the blog hop. A really lovely thing to do which will be appreciated not only by Di but also everyone who takes part. You are a star! p.s. Sorry if this comment appears twice - I was having trouble getting it here. What a fun event! Such lovely cards! I bet Di is tickled pink! What an honor!! Love both cards!! OH MY GOODNESS!! I just found this after a little hint from Kathy K to look at her blog. Darnell, what can I say? Poor Len came running as I burst into tears reading your post. Thank you from the bottom of my heart my dear friend - and huge thanks to so many who seem to have been in on the secret. Excuse me whilst I use Dudley's soft fur to wipe the tears away! I don't deserve such wonderful friends but by golly I'm so very grateful for each and every one of you! A wonderful tribute to a wonderful woman! Thanks for organizing this Dolly! Di keeps so many using up all those snippets that just seem to multiple. And she does it with all of it with kindness and humour. Hi Darnell, Loving your cards. Well done to Di for keeping that group going. I always smile and often learn something when visiting Darnell. You have a gift for writing in such an inviting manner. So nice of you to throw this anniversary for Di. YOur snippet cards are lovely, the soft colors so inviting. You're the best to do this for Di. Haven't played much with Pixie's Snippets, not because I don't have snippets but because my designing and organizing skills are lacking. They never seem to fit on an actual card. But I am most definitely going to give it a try this time. Fabulous cards Darnell and thank you for organising this blog hop for Di! 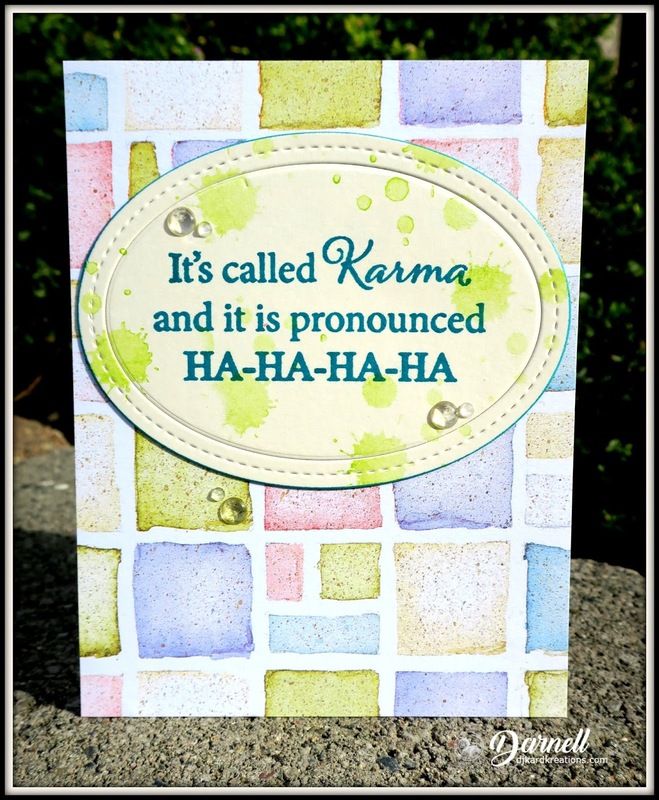 I absolutely love both of your fun cards Darnell but that karma card literally made me laugh out loud!!! Love both your cards. We have to keep our sense of humor at our age. Love the color splotches. How thoughtful to host a linky party for Di. I am going over there to do an entry on her challenge. Both cards are beautiful Darnell (hey, better late than never my friend) - I love the wording on the Karma one - so funny. How fabulous of you to think of this, I must admit that I have been very lax in entering the playground for quite a while but I certainly intend to join in this tribute to a really lovely lady. You are a star Darnell. Oops forgot to comment on your two lovely creations. I love the pastel backgrounds with the black on your first with the brilliant sentiment. Another great creation and a great definition of Karma. Well, this is just lovely, Darnell. You're always spreading goodwill and it's for a darn good reason 'cause you know how it is to run a challenge blog, plus she gives prizes from her heart. Your two cards are a great representation of snippets. Love the sentiments on each. Gosh, I have so many humorous sentiments. I do believe I'll make a point of using some of them. Thanks for inspiring! Awesome cards in Di's honor, Dolly! Love that party hat and the sentiment fits all of us to tee! A fun twofer too! Love that paper and the watercolor splots! I'll be back with a linky soon! How thoughtful and sweet of you to do this for Di! But then again, that's you! Both of your cards are full of fun. From that wee party hat to that terrific Karma sentiment! I will be joining in shortly Darnell - love your cards, they really gave me a giggle, especially the first one - Hammy's talents are expanding from winking to splotching - well done wee man! What a great idea and a lovely surprise for Di. I must confess I haven't played along with this challenge very often but when I have it's always been fun. What a fabulous idea and great that you thought of it so thank you too. I'm sure everyone appreciates all the work that goes into maintaining a challenge blog and this is something which Di does so well, long may she reign!!! My card is linked. love the brick there you did it so sweet..
What a sweetie you are Darnell for celebrating Di in such a wonderful way. I love the sentiment of the first card. So cute! Both cards are fab! I've heard you talk about the playground but I've never been there myself. How sweet of you, Darnell, to honor the headmistress with a party. I'm sure all of her Snippet friends will be glad to send/make a card. Age? What age? It's better to act as you feel. ;) I love that DSP on the second card. A stencil could probably come close to duplicating it, if I had one like it. Fun cards Darnell and I love the Karma message. Nice words for your friend Di. What a thoughtful and kind thing to do for your friend Di x. Both your cards are wonderful and great use of snippets. Fun and fabulous first one and love the design paper on the second x. A fabulous idea and thank you for organising it. Di certainly deserves to be honored. Gorgeous cards, Darnell, great use of those snippets. I'll be back with a linky soon! This is such a great gesture to someone who inspires you thru the years. You have prepared a wonderful blog-hop. I hope, I can join too. Oh what funny cards, Darnell, which I'm sure will totally delight our wonderful Ms Di! Thanks for helping us honor her in this special way! Blogging really does bring good people together and you have certainly added to that Darnell, what a thoughtful surprise Birthday Blog event for Di. There are so many great blog challenges around still to discover and PSP was sadly one of them. What a fabulous achievement of years.. Wishing many many more to come. 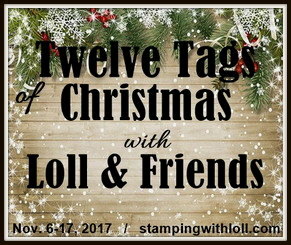 Thank You for organising this Blog Hop. I was so surprised when I saw Adrea's post and just had to make a card for this special lady to show how much we all appreciate her hard work involved in this wonderful challenge blog. I havn't managed to join in the challenge lately, but hopefully that will change very soon. I was very proud to have been awarded one of Miss Di's awards, and was lucky enough to have won quite a few times on the challenge. 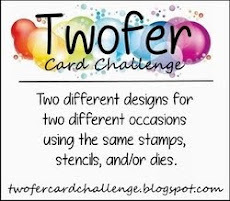 Love your twofer cards and their super designs. The first is a brilliant idea and such a colourful background. Super party hat on that silhouette and such a fab sentiment. Your second one is so colourful and bright and also cheerful. Love a big crafty hugs from my house to yours. 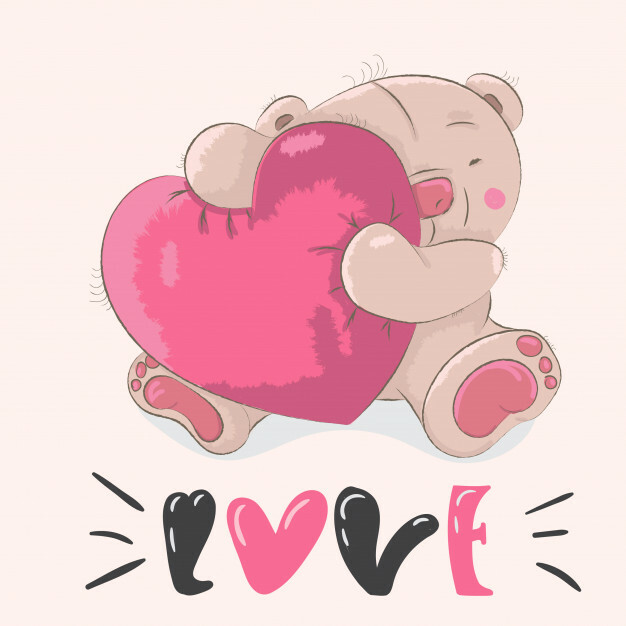 Jenny L.
Thank you so much for organising this blog hop, Darnell, such fun! Fun cards Darnell...and a fun hop. I love the playground and Di! What a great way to honor her. I'll be posting my card soon. Two fun cards, Darnell! And how special of you to create this to say "thank you" to someone you cherish! Congrats, Di, on the many fun years you've led the way on! What a lovely surprise for Di, thank you for organising Darnell! I'm sure she'll treasure this wonderful 'thank you' tribute to her. I love your two fun cards! What a super photo and fabulous cards for the event... Congrats to Di! and so sweet of you to organise this too. thanks so much for organising this Darnell - it's a fab idea. Just added my linky. Love your cards. The second one I love the background so colourful - must remember bricks don't need to be brown lol! But the sentiment is just fantastic! Love those cards! I'm so happy to be able join in to celebrate Di! As usual your snarky comments are what make your cards!! LOVE the silhouette image in the first. Totally fun!! I also like your color treatment on the second card. Such a fun challenge. I have never heard of this challenge board and will have to check it out!! Thank you for putting together this hop, Darnell! What a wonderful way to celebrate Di and all she does for us! How awesome that you got to meet her - I love the photo of you and her together! 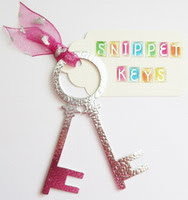 Your two snippets cards are gorgeous! The first one made me giggle! I'm so happy to join your hop! Have a wonderful day! Thank you Darnell for organazing this blog hop. I almost forget to share my card. I follow both you and Di few years and love both blogs. Thank you Darnell for doing this a great thing to organise for a lovely lady. Love you cards have linked mine for Di top. Thank you so much Darnell, for organizing this hop to let Di know how much she means to us. I am in awe of her ability to explain all the intricacies of her card-making, and to inspire me to dig through those piles of scrap in the hope of making something pretty...and all while making me giggle. I haven't been home long enough to create much these past couple of weeks but finally managed to upload a card and let Di know how much she keeps me on the crafting path. Thanks so much Darnell for organising this...such a lovely and thoughtful idea! I'm so looking forward to hopping round and visiting everyone! Love your cards...wonderful inspiration for us all too! Such a super-idea to honor Di!! She is so very deserving of the recognition and appreciation!! Love your fun cards, Darnell.....the sentiments made me laugh. Thank you for hostessing this hop. Really don't know where all those years have gone (maybe the mirror gives a clue) so appreciate all Di does, it takes time and so much commitment to keep a challenge running. 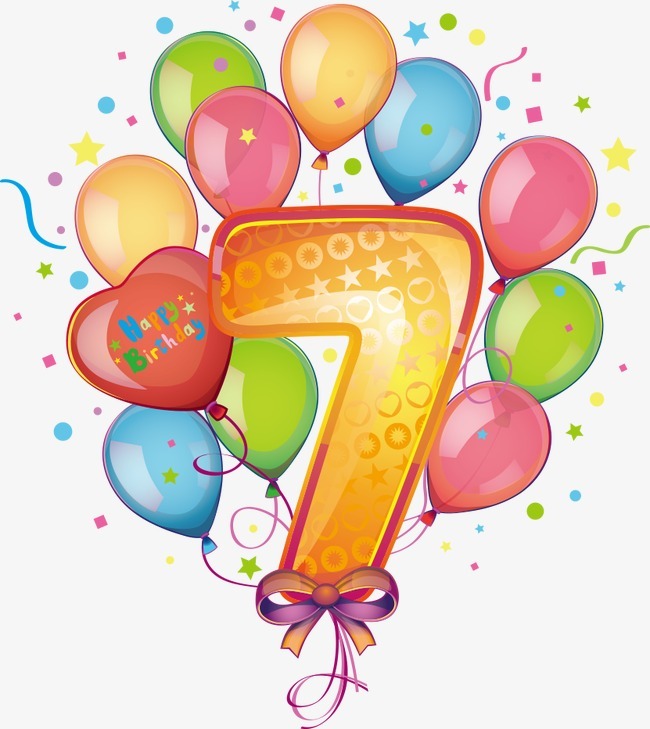 Would love to say more (and could easily ramble on), but a silly impediment called illness prevents, but so happy to be able to be part of the celebratation. Made it at last. Not very nice weather here in the playground at present. We have storm Eric battering us left ,right and centre. The duck pond is mighty full too so have had to do a large detour to get to the bike sheds. Iv'e brought me sarnies with me and hip flask . Anyone else coming ? Hugs Mrs A.